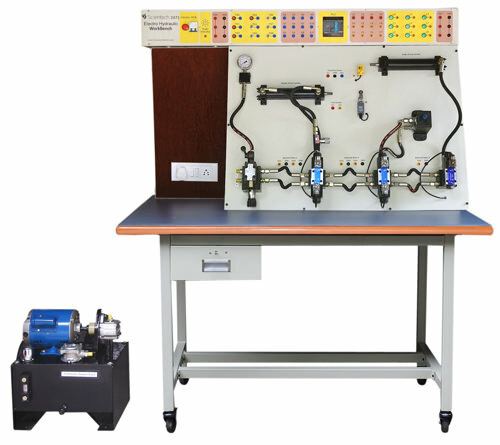 Scientech 2471 Electro Hydraulic Workbench is designed to demonstrate the design, construction and application of Hydraulic components and circuits. It integrates PLC technology to build hybrid Industrial Automation systems with Hydraulic components and modules. Hydraulic technology is found in numerous areas of engineering. Students investigate the basic “building blocks“ of modern Hydraulics and how they are interconnected to form systems. Hydraulic Systems provide the power needed to control metal forming machinery, conveyor systems, component test stands, foundries and primary metals plants, presses, including cushions, clutches and brakes, automated assembly systems, packaging systems, pulp and paper industries, material handling, and robotic systems. PLC provides flexibility to design and build numerous systems using software and I/O interfaces without changes to the hard wired connections. Two storage drawers with telescopic locking facility, place in drawers for meters, patch cords, components, bread board and other accessories for storage, easy identification and access inside the drawers.